One of the singers I grew up listening and who was without a doubt a massive influence on me was Cliff Richard. I realize I don't give him enough credit in places where I talk about my major influences but to be honest, I think some of his songs were some of the first songs I learnt to sing and actually sang in front of people. I've loved the man and his songs all these years and tonight, I'm going to take you on a trip down memory lane. 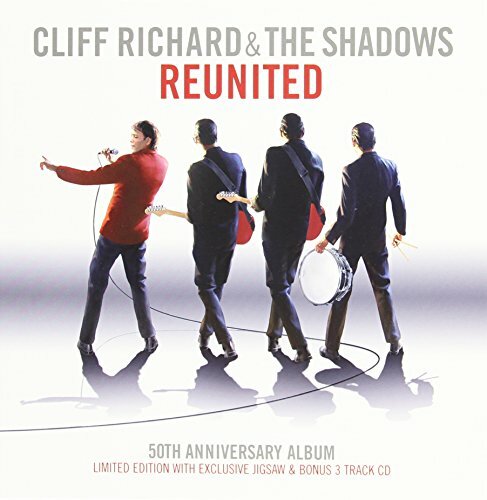 As a 50th anniversary special treat Cliff Richard or Sir Cliff to be precise "Reunited" with The Shadows and they came up with their first new album together in 40 years! Here are the bonus tracks which can be found on a bonus cd in a 2 CD special edition pack! How about that? Great songs aren't they? I hope you loved listening to them as much as I did. Here's the question for this contest. I'm going to keep it to just one question with 3 parts. In this album they've recorded 3 new songs. The songs are: C'mon Everybody, Sea Cruise and Singing The Blues. Q: Who originally sang "C'mon Everybody", "Sea Cruise" and "Singing The Blues"? In the subject put up "The MJ Show - Cliff Richard & The Shadows Contest" and send me the mail asap! Make sure you're following me on twitter, because that's where I'll be declaring the results. You can do so by looking up MusicmanMihir on twitter! Spread the word and let all your friends and music lovers know about this site and the contest! We need a lot of people entering these contests to keep them alive! So make sure you spread the word! I hope you know that there's a contest that's going on on the 50th show as well. You stand a chance to win 5 Michael Jackson - This Is It cds!! I'm hoping to meet a lot of you at the Twestival this thursday. I'll have loads of stuff for you to win over there as well courtesy EMI and Warner Music and Sony Music India!